January 2016 – Fresh from receiving their Certified Personnel Consultant certification in the fall of 2015. Rick Pascual, CPC and Trish Valenzuela, CPC, two feed industry recruiters with Continental Search commit to completing the Professional Recruiter Certification program through AIRS, one of the most respected recruiter and researcher training programs in the USA. This training and certification will take place in April 2016 in Washington, DC. This training is an example of the commitment to professionalism that all the feed industry recruiters have at Continental Search. Rick Pascual joined Continental Search as a feed industry recruiter in January 2015 from a career in call-center supervision. Since joining, Rick has made an impact on the team and has successfully filled a number of sales and sales management positions in animal health and nutrition. By completing coursework and a grueling exam, Rick became a Certified Personnel Consultant in November 2015. Rick’s educational background includes a BS in Nursing. Rick normally leads the firm’s sales and sales management searches. Trish Valenzuela joined Continental Search as a feed industry recruiter in July 2015 from a career as an international flight attendant and as an entrepreneur. Through hard study Trish became a Certified Personnel Consultant in November 2015. Trish has a BFA degree in Advertising Arts. Trish works to introduce our services to prospective clients and runs technical and sales searches. This certification and training delivers a full recruiting life-cycle program to arm recruiters with a detailed program they are able to implement immediately. The Professional Recruiter Certification program takes recruiters step-by-step through every aspect of recruiting including requisition evaluation, interviewing a hiring manager, implementing Service Level Agreements, leveraging online tools for sourcing candidates, and then implementing and executing an organized interview process. Recruiting is not just about filling requisitions; it is about the entire hiring process from start to finish. 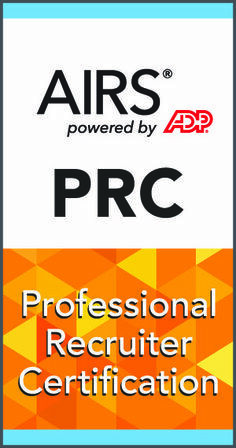 AIRS Professional Recruiter Certification is not only for recruiters but also for all Human Resources professionals looking to make a positive impact in their organizations hiring process. Upon completion of the course, all students are eligible to take the AIRS PRC certification examination recognized globally by SHRM.